CRUCIAL MILESTONE IN MARITAL JOURNEY ...attractions to make couples get their marriage right. 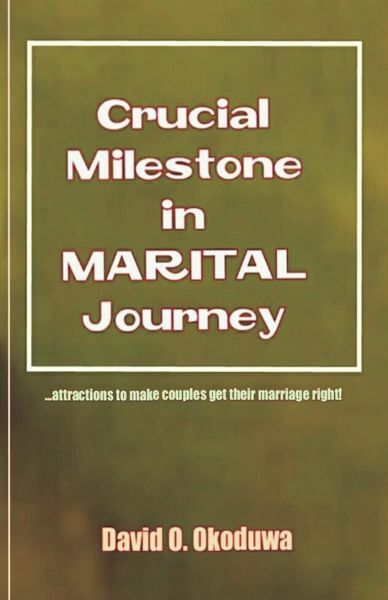 Crucial Milestone in Marital Journey contains valuable topics which are attractions to make couples get their marriage right and these include; steps to merging and cleaving together of spouses; areas where tolerance becomes invaluable in marital arts; stages of marriage setting and their consequential assessments; puzzling situations observed in marriage and reasons for them; counsels indicative of ways marriage should be handled and steps to adopt; and presenting individual spouse’s roles in building a home front. Recommended for married couples, counsellors, educators as well as religious organizations! Hey! Don’t open this book carelessly until you are eager to enjoy a happy marriage life and do not let your spouse read it until you have finished it and have made right what must be corrected on your part. A milestone is ahead of you… Race it off!